I have a soft spot for goat cheese. Actually, generally speaking, I have a soft spot for goats. I have a fantasy of keeping a small herd of goats and making cheese from their milk. I’ve researched it, so I doubt I’ll ever fulfill this dream, but it’s still in my head. 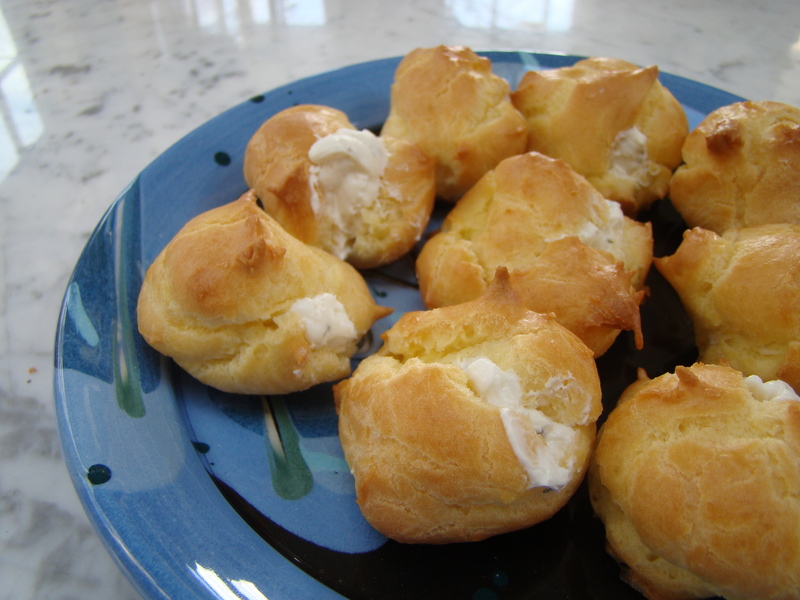 This week’s French Friday recipe is for goat cheese mini puffs. These are small savory cream puffs stuffed with an herbal goat cheese filling rather than pastry cream. Definitely intriguing. 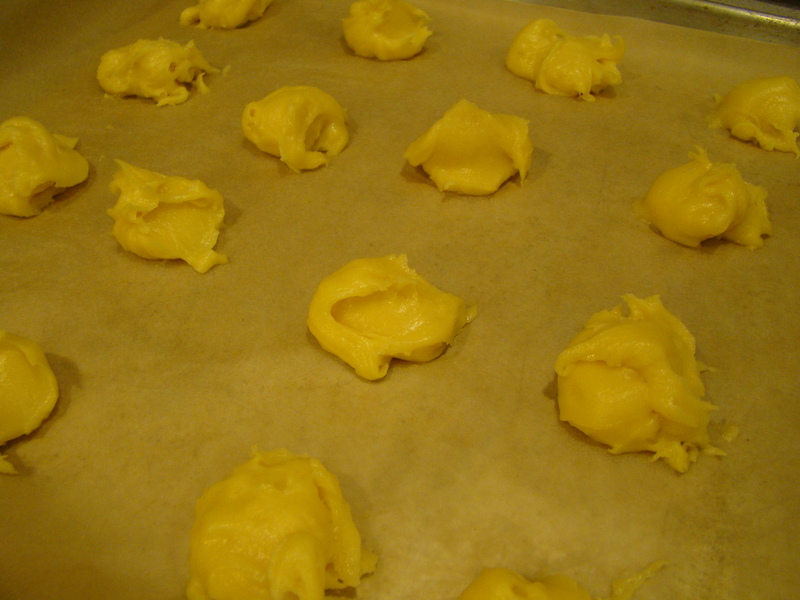 First step is to make the cream puffs. I’ve only made pâte à choux for French Friday recipes. Previously, we made éclairs and gougères, and now these mini puffs. Each time, I’m amazed at how magical it is to see the pastry transforming from seemingly dense dough into puffy little balls. This time was no exception. Flour is stirred into a pot of boiling milk, water, and butter. Then, eggs are beaten into the warm mixture to make shiny dough. Spoonfuls of dough are placed on the sheet and baked until puffed and golden. 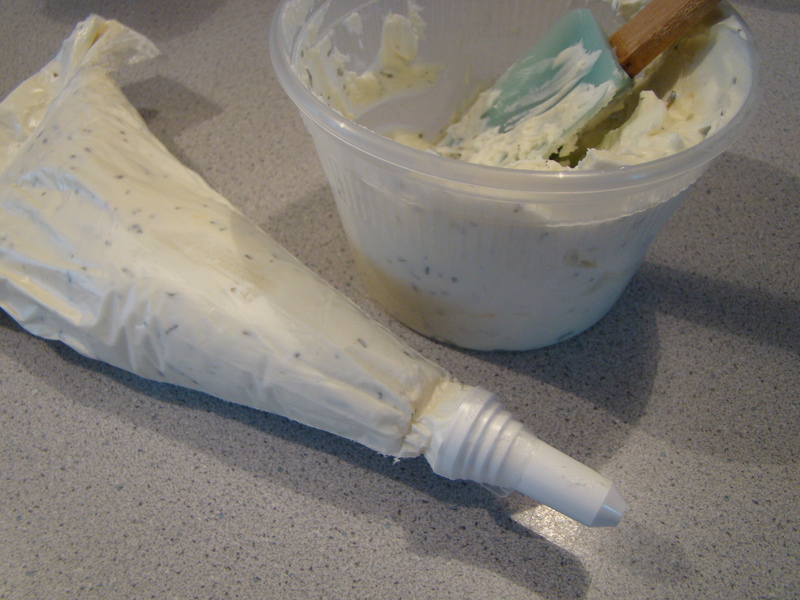 I didn’t read the recipe well before I went shopping, so I bought plain goat cheese instead of herbed. No problem. 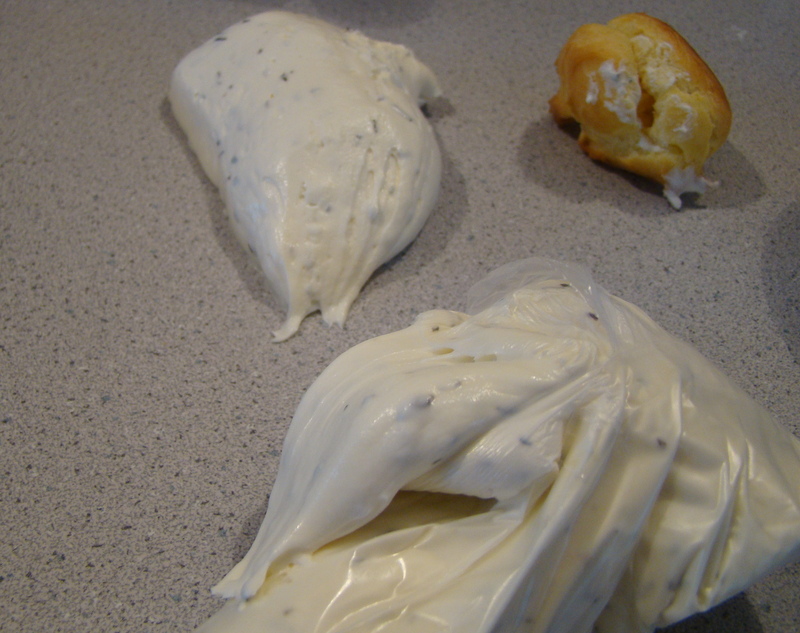 I added a teaspoon of dried herbes de Provence when I mixed the chèvre with cream cheese and cream. 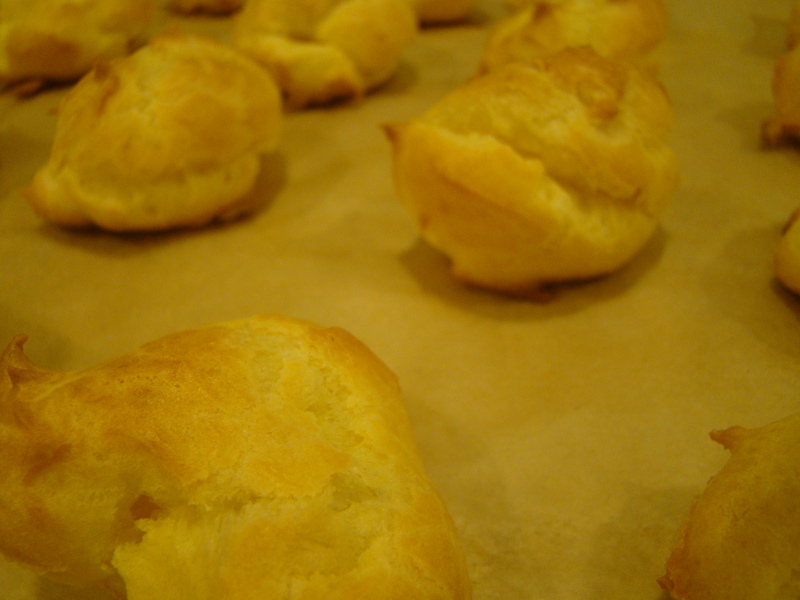 I got a chance to whip out my never-before-used pastry bags with tips to fill the cream puffs. The recipe said a small plain tip, so I used the smallest tip which was the only one without fancy edges. I think it’s meant for writing with icing because the filling was too thick to come out easily and I popped the bag. Oops! A Goat Cheese Explosion! When I switched over to a slightly larger star tip, it worked much better. Some of the puffs already had a little hole for filling. For the others, I used a chopstick to make a little hole for inserting the tip. Due to a timing glitch last night, I didn’t serve these as an appetizer. I served them as an accompaniment to a bowl of soup for lunch. I have to say that I didn’t LOVE these as much as I expected to, though I did like them. I ended up baking the puffs the night before I filled them, and might have stored them a little too airtight so they weren’t crusty, but a little soggy. I still have some left, so I might reheat them a bit before filling and see if that improves things. I liked the impressive presentation though. I’m going to a holiday potluck next month, and these might be the perfect finger food to bring for my contribution. You can find the recipe in Dorie Greenspan’s book Around My French Table. I’m looking forward to reading about what my fellow FFwD bloggers thought about this week’s recipe. Check out their links at French Fridays with Dorie. Posted on 16 November 2012, in French Fridays with Dorie and tagged appetizers, cream puffs, French Fridays with Dorie, goat cheese, goats. Bookmark the permalink. 12 Comments. I couldn’t buy herbed goats cheese so I added chives to mine. I loved these. Yours look good – I like your dream of owning a herd of goats. I decided to make mine with goat cheese feta and they tasted great! I had plain goat cheese in the fridge so that’s what I used. I added some fresh thyme from my garden. I really loved these! Yours look perfectly delicious! I only made nine and froze the rest…I will take them out for Thanksgiving. Betsy, these small gaot cheese filled puffs/gougères/Windbeutel (I cannot decide which name I like best for these) of yours look wonderful – actually, I like the idea of bringing them to a potluck during the holiday season, I will follow your suggestion and make some for the big holiday buffet table for my husbands colleagues. I am always at a loss for “new” ideas of finger food that I should prepare for these types of events. Have a wonderful weekend – if and when you get goats, let me know, I might then buy a few myself, I love goats! Come to think of it, I should send you one of the wonderful coffee cups from Bonn with the lovely goat design. Betsy it looks like you had fun making your puffs ;-) I gave up on the piping and went with the slice and spread method! I put a dozen or so plain puffs in the freezer to see how they hold up being defrosted and warmed before adding the goat cheese, hope it works out! I went on several field trips over the years to a place by us on the coast called Slide Ranch where they raise goats- interesting trip for all of us-goat farming is pretty cool but not for me!!! I had some mini-puffs left over and heated and filled them the next day (okay, I admit, for breakfast). They just weren’t as good and I couldn’t bring them back to the original. I think if you aren’t going to eat them immediately, then it’s a good idea to throw them in the freezer for another time. I admire that you gave your pastry bag a “go”. Mine is still sitting in its wrapper in the cupboard. But slicing the mini-puff in two and filling it was not as pretty a presentation as yours. Loved your thoughts about raising goats. Of all the many ambitions and goals and “I wish I coulds”, Betsy, raising goats was not one of them!!! Happy Thanksgiving. I love working with you. I had the same problem with pipping the filling in those little balls of air myself…at the end I gave up and used a spoon!! The look great!! I had the same issues with piping the cheese into the puffs. That is always a chore for me, and this experience did nothing to endear me to it. Your puffs look very tasty! Your puffs look very tempting. Have a great holiday! Your puffs looks so beautiful and golden. I was thinking about making mine on Wednesday because I plan to take these to my sister-in-law’s for Thanksgiving, but after reading your post I think that I will make the puffs on Thanksgiving morning and the cheese filling on Wednesday. I missed making these last week because I had one of those weeks where I just ran out of time on everything.